WebGuy here. I'm sitting here in sunny California on this Friday afternoon, but like many of you I am headed to Colorado Springs shortly. In my case, I am here to speak to candidates who are in the application process and who might become your classmates at USAFA next year. I will be back in time for the arrival of the prior-enlisted appointees coming to USAFA Prep directly from the Air Force and will arrive on Sunday. We will begin to take the first of thousands of WebGuy Prep photos over the next 10 months. As you prepare to travel for Prep In-Processing, I thought you might like a preview of what I-Day has in store. Keep in mind that the weather will play a part in how things actually go. That being said, here is the flow with pictures from previous years. 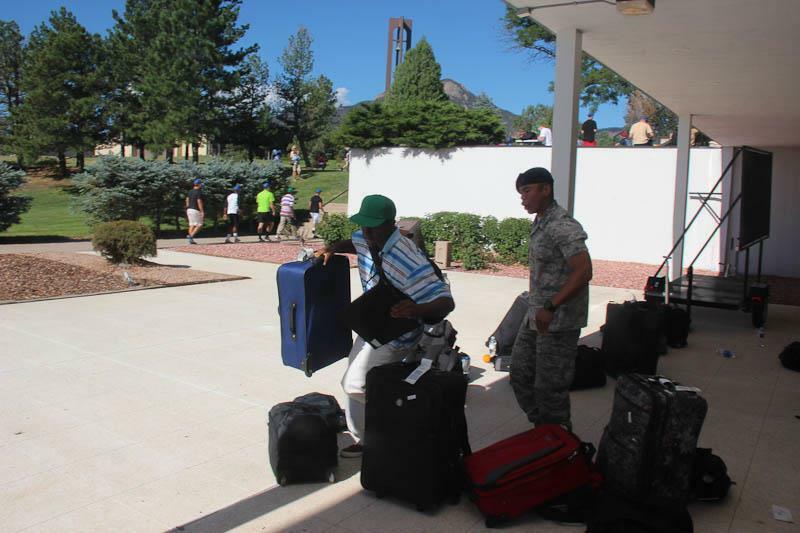 Prep Appointees arrive at the USAFA Community Center between 7:30 & 8:00 am. Since everyone arrives within 30 minutes, there will be a line. We will have water available. Enjoy your time together, meet the other Prep families. The WebGuy team will be there to take your picture while you wait. Look for our gray polo shirts! The line moves pretty quickly to the first station, where your appointee will fill out some paperwork, and find out what Prep squadron they are assigned to. Alpha (Red Hats), Bravo (Green Hats), or Charlie (Blue Hats). Also referred to as 1st, 2nd, or 3rd Squadrons. Now it's time to head down the stairs to drop off luggage, so they don't have to lug it around for a while. Parents, you can still be with your appointee, but you will have to wait while they drop off their luggage. Once bags are dropped off it is time to sign in, and get ready to say your good byes. The Chaplains will have refreshments and solace (if needed). You can also meet and talk to the WebGuy team and sign up for Class Club to get all the photos during BMT and the entire Prep year. If you want to do that now, Click HERE for a link to get more info about Class Club and sign-up. There are a couple of more stations in this stage where parents are able to stay with their appointee, but then it is really good bye time. The Basics then collect their luggage and begin their new lives. As familes we can only watch from a distance now. But never fear!!! Your WebTeam will be right there every day during BMT to be your eyes and ears during the next 3 weeks and throughout the next 10 months.